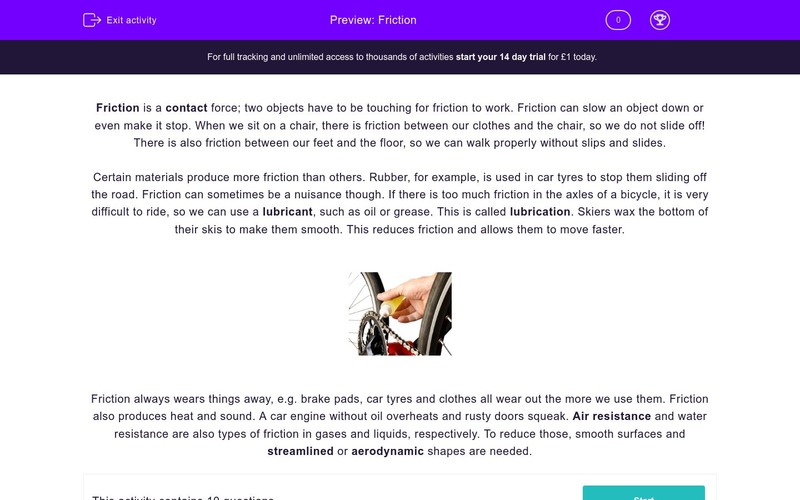 In this worksheet, students learn what friction is and how it affects our life. Friction is a contact force; two objects have to be touching for friction to work. Friction can slow an object down or even make it stop. When we sit on a chair, there is friction between our clothes and the chair, so we do not slide off! There is also friction between our feet and the floor, so we can walk properly without slips and slides! Certain materials produce more friction than others. Rubber, for example, is used in car tyres to stop them sliding off the road. Friction can sometimes be a nuisance though. If there is too much friction in the axles of a bicycle, it is very difficult to ride, so we can use a lubricant, such as oil or grease. This is called lubrication. Skiers wax the bottom of their skis to make them smooth. This reduces friction and allows them to move faster. Friction always wears things away, e.g. brake pads, car tyres and clothes all wear off the more we use them. Friction also produces heat and sound. A car engine without oil overheats and rusty doors squeak. Air resistance and water resistance are also types of friction in gases and liquids, respectively. To reduce those, smooth surfaces and streamlined or aerodynamic shapes are needed. Friction is a _________________ force. What stops us from sliding off a chair when we sit on it? Give an example of a material that causes a lot of friction. Give an example of a lubricant. What do we call it when we oil a squeaky door? What do skiers use to make the bottom of their skis smoother? What would happen to a car engine without oil? What two qualities are used to describe something that does not have a high level of friction? There can be friction in gases and liquids. Friction is a contact force. Friction stops us sliding off chairs. Rubber causes a lot of friction. Oil and grease are lubricants. Lubrication is when we oil an object to reduce friction. Skiers wax the bottom of their skis to make them smoother. A car engine without oil would overheat. Air resistance is friction in air. Streamlined and aerodynamic shapes reduce friction. Yes, friction can exist in liquids and gases.